Driven kids, challenging facilities and some surprising results. In this blog, we take a look at the Football For Good Academy, Uganda's only full time football program achieving results against the odds. For the past 3 months I have been coaching in Gulu, Northern Uganda. There have been many new experiences during this period including; a brush with Malaria, poisonous snakes in the bathroom, intense heat, spectacular thunder storms and the daily battle for good Wi-Fi! On the field, life has been equally exciting. The stay has definitely pushed me out of my comfort zone and is a whole world away from academy football in the UK. Of course sweeping generalisations are dangerous, but the raw and real scene in Uganda presents a set of challenges which puts the problems at home into perspective. For example, at a parents day I meet Sam Opio, father of academy duo Yona and Abraham, Mr. Opio is a single parent and HIV Positive, the academy offers a life and hopefully a future for his sons that he simply could not create. I first visited Uganda in 2015, having been introduced to the Canadian Academy Director Adrian Bradbury via email. I stayed with his family for 2 weeks. In April 2016 Adrian invited me to visit for an extended period, so my partner and I traded life in West London to live in Northern Uganda. In my role as Head of Coaching the aim was to develop the players and native coaches and build on the foundations Adrian had built. Following civil war which spanned almost two decades, Toronto based Bradbury has been involved with charitable projects in the region for 10 years and took the plunge to start Uganda's first full time football academy in January 2015. This decision included moving his wife and sons Isaac (15) and Owen (13) to Gulu, both boys swapping the turf pitches of Power FC for the dusty pitches at Layibi where all 46 players eat, sleep and train every day. 16 months on the 'Football for Good' academy has gone from strength to strength, at school the players are amongst the brightest in their classes, on the pitch the academy sides compete several years up, playing against men's sides from the district. The "Under 16" group come off the pitch drawing 2-2 with thirteen year old Mwaka scoring the equaliser past the visiting 20 year old goalkeeper. The sole focus here is on developing individuals, results come but they are secondary to pushing each and every player. Culturally this is not the norm, people believe in winning with direct football and strong athletic players. This leads to local schools and coaches selecting over aged players, a problem which runs deep in the country. During my time here, Uganda's U20 side have their win against Rwanda overturned after fielding an ineligible player. Uganda is not a footballing world power; currently ranked 79th in the world they last qualified for the African Cup of Nations in 1978 and have never reached the World Cup finals. Eastern Africa is a region of 325 million people with limited football structure and very little attention paid to developing the next generation. The feeling here is players "make it" in spite of the system, not because of it. Bradbury's vision is to start with the youth, the academy runs 3 groups with Genesis the youngest at 9, through to the U21 group featuring Allan and Pixie, players the academy are supporting through their university studies. 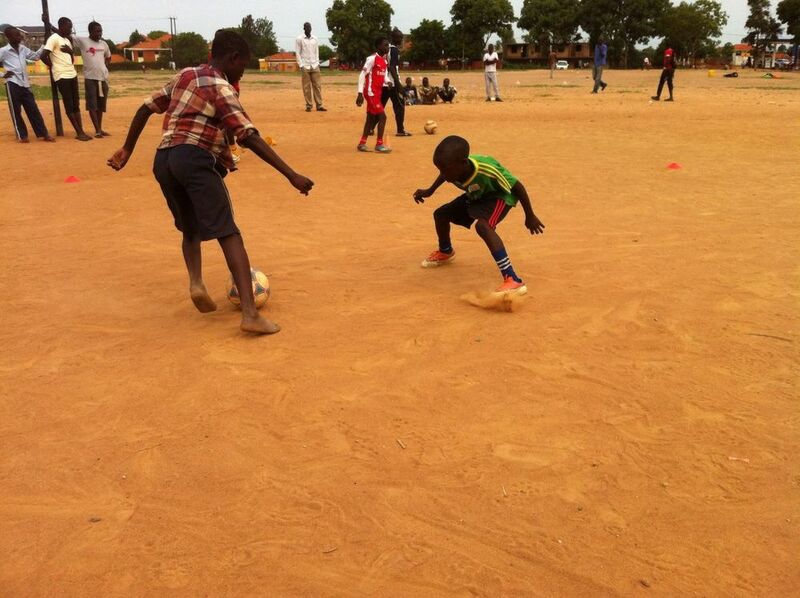 After attracting the best players locally, the academy in Gulu is now firmly established. With the aim of unearthing the best talent in the region we travel 4 hours west to Arua for a weekend of identification. The trip isn't without scenery, we cross the Nile at Pakwach and an Elephant pauses for thought on the roadside as we skirt around the national park. With neighbouring Sudan and Congo now less than an hour away, the town is an intriguing mixture of nationalities, cultures and languages. James Obalo (Public Relations Officer) leads registration on the Saturday morning, 385 hopeful young players turn up, most barefoot but all with the desire to seize the opportunity presented to them. The prospect of free education, food and board, as well as football every day is a dream for most. May 28th 2016 is a big day for the Football For Good academy, 16 of the players will travel to Dar es Salaam for their first taste of an international tournament. Although many of the players have played in the Coca-Cola Copa; The National High School Championships, few have ever left the country. With vaccinations and identification papers complete we begin the arduous journey from Gulu to the largest city in Tanzania , via Nairobi. After a break down, several border control issues and 54 hours in the bus we finally arrive at the Chamazi Stadium, the home of Tanzania Premier League side Azam FC. The facilities are another new experience for the group; players remove their sandals and some even stroke the pitch as the encounter an artificial turf for the fist time. The swimming pool also causes a stir, with the vast majority of the group not able to swim the afternoons water-polo game lacks quality but is certainly enjoyable. The four team tournament hosted by Azam FC saw Ligi Ndogo (Nairobi), Future Stars (Arusha) and Football For Good (Gulu) compete in a round robin format. Game one saw us take on Ligi Ndogo under the lights at Chamazi. As coaches we weren't 100% sure what to expect, the players had limited experience of competing outside of the district and there were many new factors such as the pitch, the lights and the crowd that we couldn't influence nor could we predict the effect on the group. The game was extremely pleasing, we started like a house on fire; dominating possession and creating numerous chances on goal. We were 1-0 up at the half, but the game finished 1-2 with Ligi Ndogo scoring with their only chances at goal. Despite the loss, we were delighted with how the team had expressed themselves and entertained the local crowds with attacking football. The second game saw us play the hosts, Azam FC. Azam are a reasonably new club having formed in 2007, but with significant investment the club has now become one of the big 3 in the country, winning the Tanzania Premier League in 2014. We knew this game represented the biggest challenge of the week: Azam were older, more experienced and very athletic. Unfortunately our lack of big game experience showed as we conceded 3 goals in a difficult 15 minute spell, as Azam went up the gears. The players adapted well in the second half and competed with the professional club, passing the ball better and creating chances. This game was a great lesson for the group, with individuals showing they could compete at the highest level. The week in Tanzania was not all matches and training. Off the pitch there was a lot for the players to enjoy and more "firsts" for the boys from Gulu. A visit to the picturesque beach at Kigamboni gave the players another opportunity to practice their new found swimming skills. We were also fortunate to visit the National Stadium as Tanzania took on Egypt, with Mohamed Salah impressing as Tanzania fell to a 2-0 loss. Back at Chamazi, the final game saw us take on Future Stars, the team from Arusha, Northern Tanzania. In our pre-game meeting we discussed how, as a group we had played well in spurts but had yet to collect the 3 points our performances had deserved. There were similarities to the first game as we started brightly, going 1-0 up inside 2 minutes. The boys pressed with aggression and looked in control as they passed the ball with purpose and constantly threatened the Future Stars' goal. At the break we were 2-0 up, with goals from Stephen 'Kabila' Bongomin and Kilama Dickens. We used the interval not just to praise the group, but to remind them that we had been here before, we led in the first game and came off losing after not taking our chances. The group took heed of the advice and showed a new ruthless streak, the temperature now at 32˚ the team ran the opposition off the park, with their forward runs and relentless pressing. The game finished 8-0, the locals cheering on from the stands in appreciation. Azam FC dominate the tournament winning all 3 games and netting 12 goals, Football For Good finish 2nd based on superior goal difference. A pleasing end to a week in Dar es Salaam, an adventure in which the players and coaches learnt a lot about Youth Development in East Africa. As the Azam Youth Cup draws to a close, Adrain's attention now switches to the youngest age groups. The U13 and U15 groups have been invited as guests of the French Embassy to a tournament to celebrate the start of the European Championships. Similar to the older boys, the majority are travelling out of the region for the first time. The pitches at the international school inspire the young players, the U13 groups are a joy to watch; 9 year old Genesis nutmegging his opponent, Innocent scoring 6 goals in one half and Adrian's son Owen dictating play from the centre of the park. Both teams win their age categories, a great way to end to a memorable time in Uganda. In the 10 weeks I have spent with the academy it is clear, despite the challenges, there is talent and huge potential in the region. It also proves that people, not facilities make academies work; from the grit and desire of the players to the vision of Adrian. 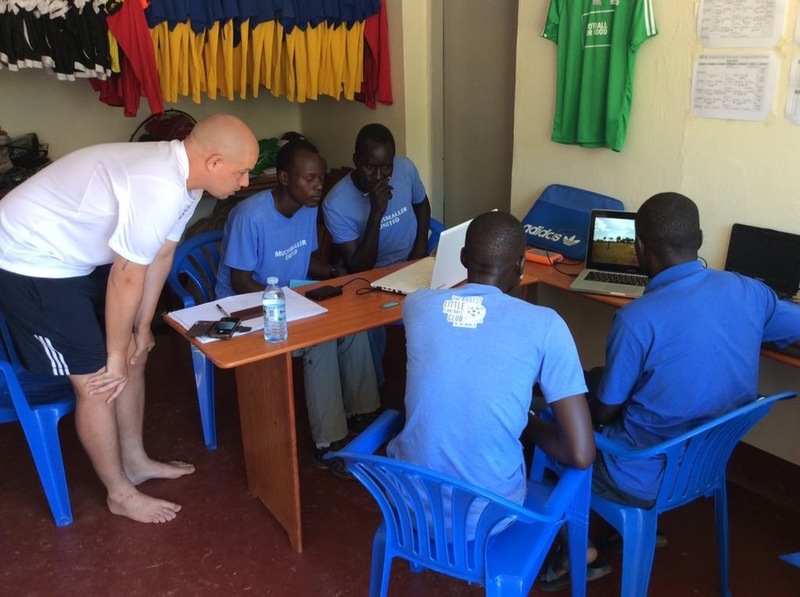 To learn more about the great work Adrian is doing in Gulu, please visit the Football For Good website.